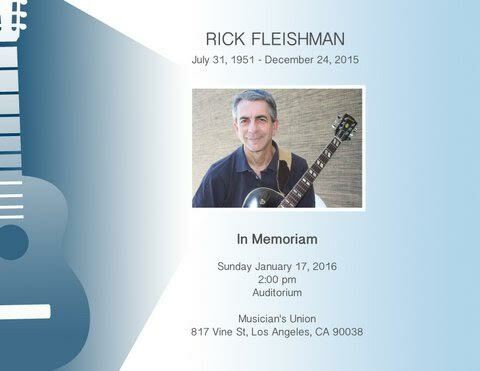 On Christmas Eve my dear friend Rick Fleishman departed this world after a 10-month battle with brain cancer. Rick was an intelligent, ethical and talented human being whom I met while working casuals some 36 years ago. Our friendship, along with musical and business partnerships, grew quickly. He was a great guitar player with whom I collaborated with on many jazz, pop and movie projects. But most of all he was a close friend who will forever be missed. He is survived by his loving wife Albina and loyal daughter Sara. There will be a memorial to him at the Musician’s Union Sunday afternoon, January 17. This entry was posted in Final Notes / In Memoriam and tagged January 2016 Final Notes, Rick Fleishman on January 4, 2016 by admin.